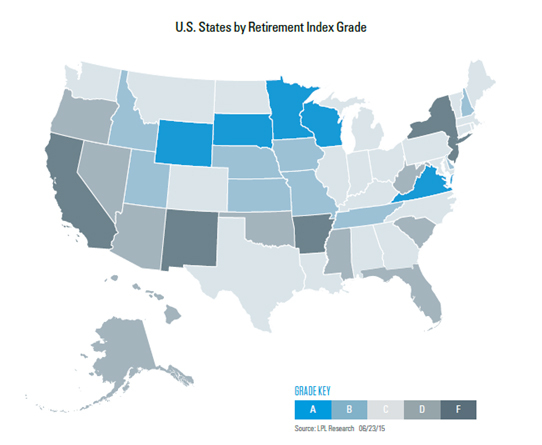 The chart above measures LPL’s retirement index, which ranks U.S. States on their appeal to pre-retirees as they prepare for retirement. It provides an overall score, generated from the average of scores on various factors that appeal to pre-retirees. 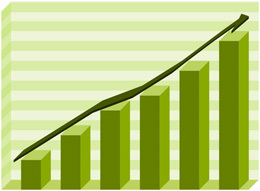 These factors include: financial, healthcare, housing, community quality of life, employment and education, and wellness. Of the 50 States and the District of Columbia, the overall score breakdown was: 5 with an ‘A’, 9 with a ‘B’, 22 with a ‘C’, 10 with a ‘D’, and 5 with an ‘F’. New Jersey scored the highest in the “Employment and Education” category, with a ‘B’. New Jersey also earned a ‘C’ in both “Healthcare” and “Wellness”. New Jersey earned an ‘F’ score overall.